While writing The Book Club Belles, I enjoyed reimagining each of the three Jane Austen stories that I selected for the series— PRIDE AND PREJUDICE, SENSE AND SENSIBILITY and PERSUASION. It gave me an excuse to re-read those wonderful books yet again, of course, and to study them in even greater depth than before. When it came to borrowing those plots and characters, weaving them into my own stories, I knew I took on a formidable task. Austen’s novels have so many devoted followers, I wanted to be sure that my versions added a little something fresh and new, without spoiling the charm of her stories. But as a long-time fan myself, I was excited to face that challenge and, hopefully, I managed without offending anybody! I could never choose a favorite Jane Austen novel. That would be as impossible as it is to choose a favorite from among my own creations. Each story has characters I love as dearly as old friends, so how could I pick out just one? In each case, the characters Jane wrote are not just sketches, but fully developed and recognizable to us, even two hundred years later. We’ve all met a Mrs. Bennet, an Anne Elliot, or a Marianne Dashwood. I believe it’s that comfortable familiarity that makes us first fall in love with Austen’s novels and then keeps them close to our hearts. When we follow the journeys taken by these delightfully real and fallible characters, even if we are reading their story for the twentieth time, we still enjoy every word. We laugh and love along with them, and often find things we missed before. To me, an Austen novel is like a box in the attic, full of knick-knacks to rediscover, or an old photo-album of memories that I like to revisit occasionally. Her stories can cheer up the worst mood on a rainy day, keep a nervous mind off a bumpy plane journey, or make a relaxing swing in a hammock complete. A Jane Austen novel is always appropriate for any occasion, never out of place, never stressful or disturbing. It is, in fact, the company of an old friend. The first book I chose to re-imagine for the Book Club Belles series was PRIDE AND PREJUDICE, because of that enduring love story of first impressions gone awry and all the amusing characters that inhabit Elizabeth’s family. The five Bennet sisters, in my version, became the five members of the Hawcombe Prior book society— Diana, Cathy, Rebecca, Justina and Lucy. Thus, the series began. For the final book, I came to Diana’s story and for her I chose PERSUASION, as a story of love lost and found. Diana—just like Anne Elliot, in Austen’s book—is the most mature of my Book Club Belles heroines and is often in danger of being dismissed as a wallflower by her family. But through the progress of her journey she learns how to speak up for herself, take a risk and boldly grasp her unexpected second chance. Each of the Book Club Belles has their own special place in my heart and to pick a favorite would be impossible. Each story was fun to write, each character providing me with a thrilling new challenge. There were some surprises along the way, as certain bossy characters took over their own plots and tried to go wandering off, but thanks to Austen’s timeless stories they could not go far. Actually, I think they were enjoying themselves too much following the footsteps of her beloved heroes and heroines. What is your favorite Jane Austen story? 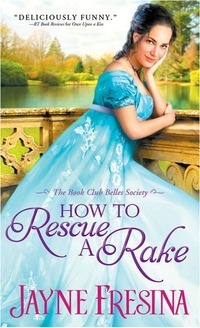 One commenter will win a copy of HOW TO RESCUE A RAKE. 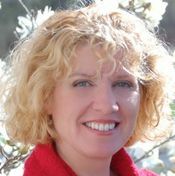 Jayne Fresina sprouted up in England, the youngest in a family of four daughters. Entertained by her father’s colorful tales of growing up in the countryside, and surrounded by opinionated sisters—all with far more exciting lives than hers—she’s always had inspirations for her beleaguered heroes and unstoppable heroines. To comment on Jayne’s blog please click here.